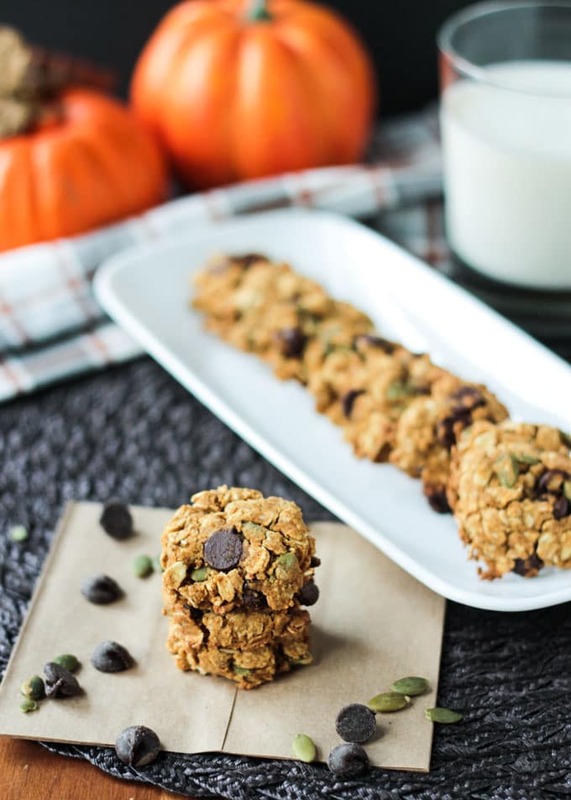 Gluten Free Pumpkin Oatmeal Chocolate Chip Cookies – quick and easy, healthy cookies perfect for fall. I bet you can’t eat just one! Nut-free, oil-free, egg free, and vegan! 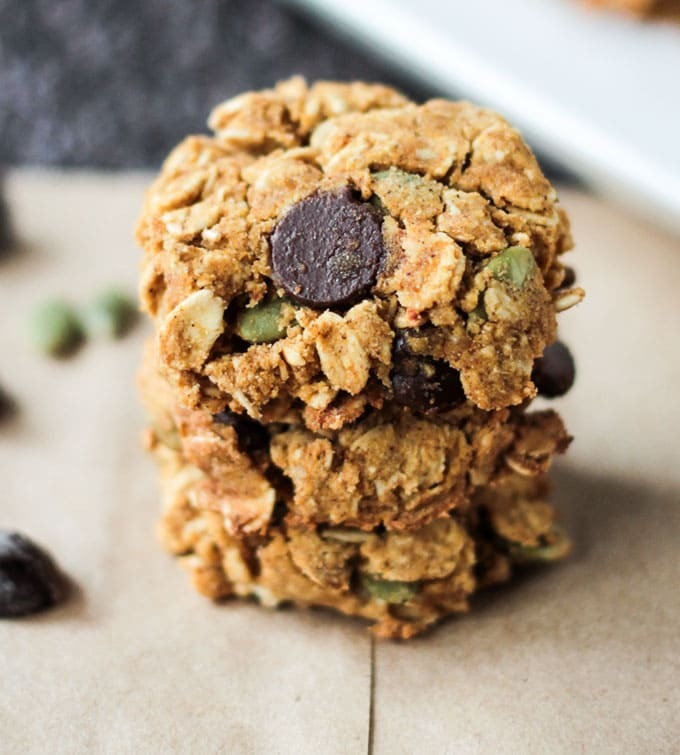 These Crunchy Gluten Free Pumpkin Oatmeal Chocolate Chip Cookies are super addictive! They are bite size and I dare you to try to eat just one! Good news though – you don’t have to stop at one because these fall treats are healthy, too! Eat ’em for breakfast, dessert, or any snack time in between! I usually use almond flour in my gluten free cookies, like in my Cinnamon Sugar Cookies (a reader fave! ), Chocolate Gingerbread Cookies, and Cranberry Pistachio Cookies. 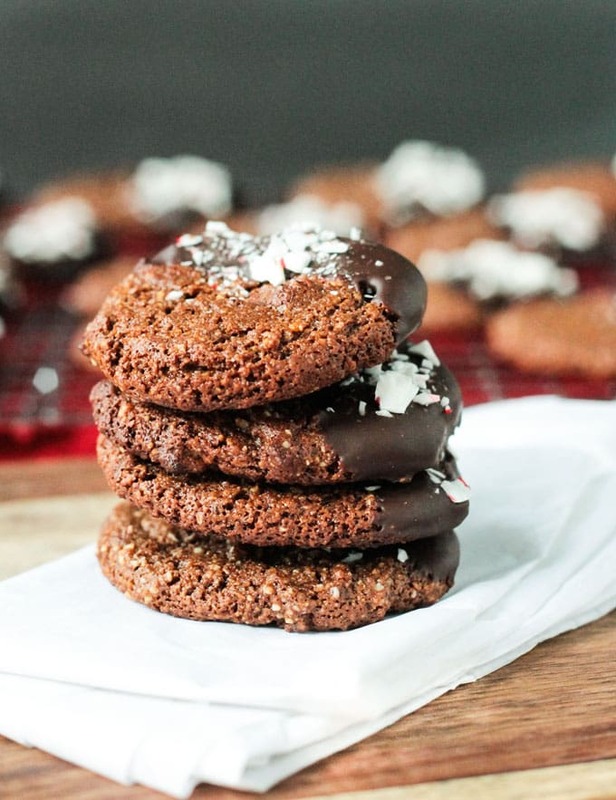 Those cookies have crispy edges with chewy centers. I wanted these Pumpkin Chocolate Chip Cookies to be crunchy throughout, so I went with oats and brown rice flour instead. It worked perfectly! I added pumpkin seeds for an extra crunch factor. You can add chopped nuts if you like that better. Walnuts, almonds, hazelnuts, and pecans would all be good choices. 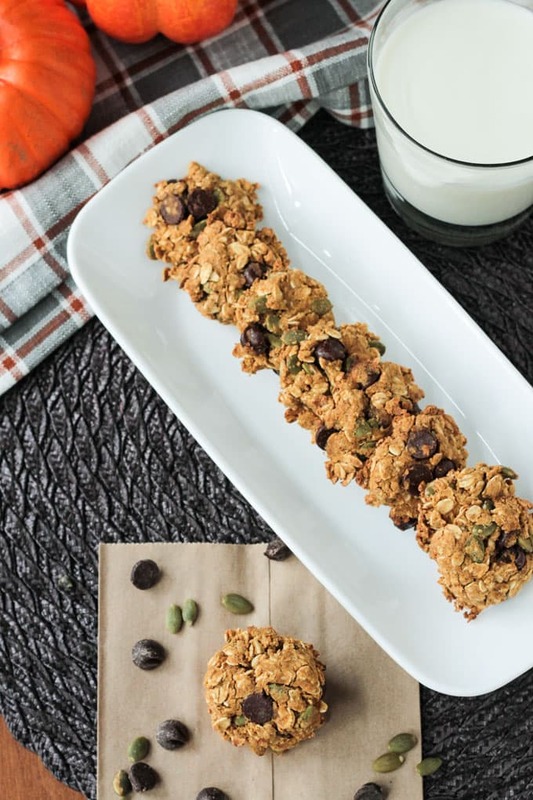 These healthy little cookies boast delicious warm fall flavors. Not only are they flavored with pumpkin pie spice, but there is almost a whole cup of pure pumpkin purée in them, too. 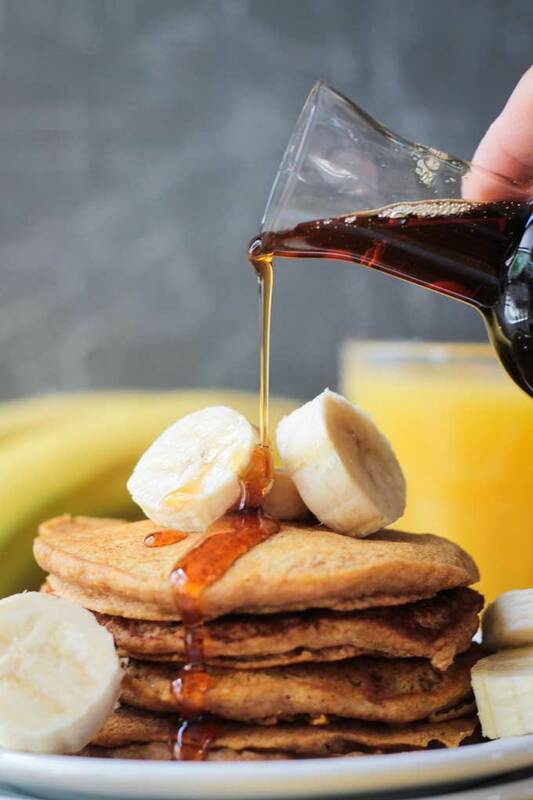 I use unrefined pure maple syrup to sweeten them up and meld all the cozy flavors together. The kids were so excited when these rustic crunchy beauties came out of the oven. They could barely sit still as I took my photos. The girls both had 3 or 4 right then and my son downed 3 the second he walked in the door from school. Guess what he asked for in his lunch yesterday too! 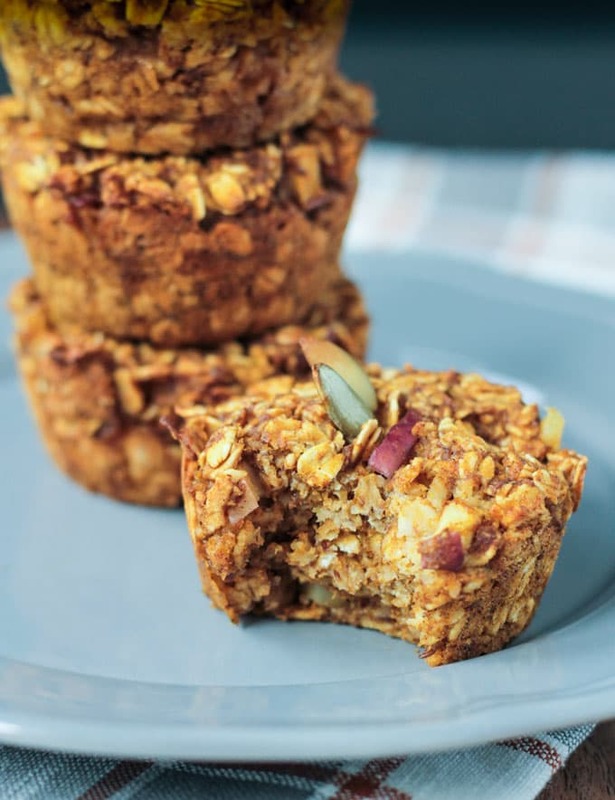 Since they are nut-free, they make perfect lunchbox treats or school snacks! 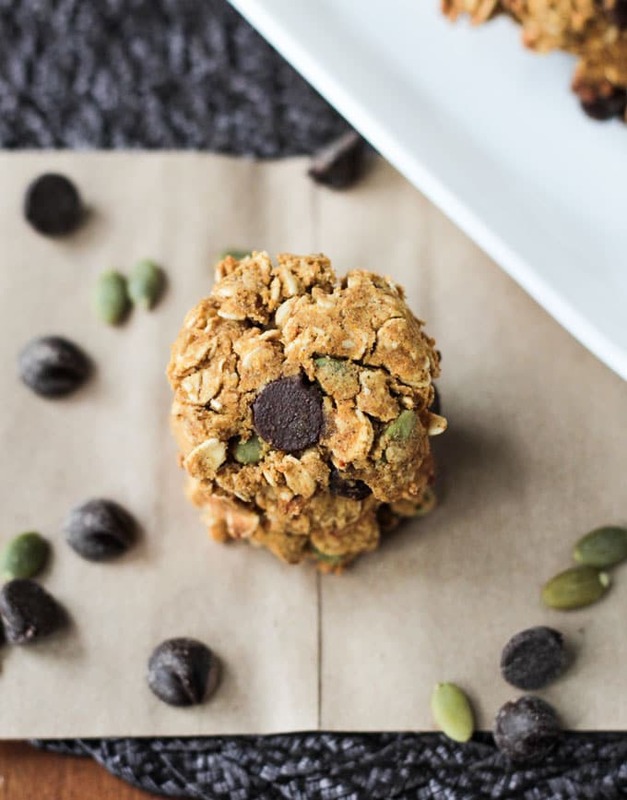 With ingredients like real pumpkin, rolled oats, raw pumpkin seeds, cinnamon, and, of course, chocolate chips…what’s not to love?! Give them a try today! Go ahead an grab a big handful…and then come back for more. And you know what I think — these would make a delicious present packaged in a jar and tied with a nice ribbon — perhaps for teachers, neighbors, mailmen, Santa, etc. I can’t wait for you guys to try these! Please leave me a comment below with your feedback and star rating once you do. You can also find me on social media. Be sure to tag me @veggie_inspired and #veggieinspired so I’m sure to see it! 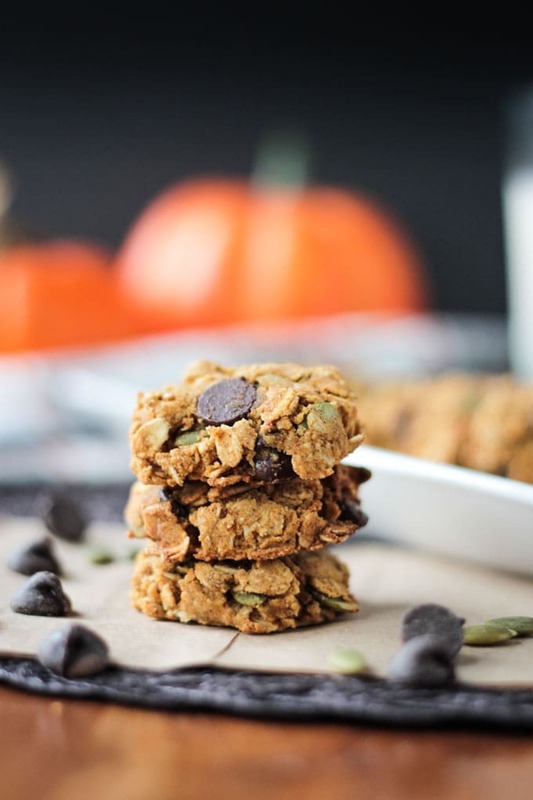 Crunchy & healthy gluten free cookies perfect for a fall treat. Quick and easy to make! In a medium mixing bowl combine oats, flour, pumpkin pie spice, cinnamon, and salt. In a small mixing bowl, whisk the pumpkin puree, maple syrup, and vanilla until combined. Pour the wet ingredients into the dry and stir until evenly combined. Stir in the chocolate chips and pumpkin seeds. Press down on the tops of the cookie balls to flatten them. The cookies will not spread or flatten on their own so make them the shape you want them now. Bake for 20-25 minutes until lightly browned and crispy on the edges. The cookies will continue to crisp up as they cool. Let cool for a few minutes on a wire rack before digging in! Yum, yum, yum, yum, yum, yum, YUM!! These will be a regular feature at my place now … stuff the Aussie Anzac Biscuit! LOL! Yay! So happy you love them!! do you bake with the chocolate chips inside?? I just updated the recipe…can’t believe I left them out of the instructions. Thanks for bringing that to my attention. I’ll hazard a guess … roughly chop and mix in with the choc chips? Good catch! Sorry about that. Yes, mix them in with the chocolate chips. You can chop them up if you want, but I usually just leave them whole. I’ll fix the instructions now. Thank you for pointing that out! Enjoy the cookies! Who can turn down a kid approved cookie? Those kids are smart! These really do look and sound delicious. Love the pepitas too! Kids know best! Thanks, Ginny! Love that I have a healthy version in my book now. Jenn, can we freeze the cookies? I’d like to make several batches and freeze them for winter while fresh pumpkin is in season since I make my pumpkin puree from scratch. Thanks, Noor. I’ve never tried freezing them. I think if you freeze after they are baked, the texture of the cookie will definitely change. Perhaps if you freeze the dough before cooking? I think that might work, but again, I haven’t tried it so can’t say for sure. I make a double batch of these and freeze them after they’re baked. They’re still delicious and crisp out of the freezer. I also use pureed butternut squash instead of pumpkin for these cookies, also great! These cookies look so good and I love that they’re healthier than most cookies! Perfect for a fall treat! I’m printing this right now! I’ve been looking for something like for a few days now, and I know my son will love them. Thanks for the recipe! Oh Yay! I hope you both love them. Let me know how they turn out! My mornings are always so busy, so these breakfasty cookies would be perfect for me to grab on my way out of the house. Thanks, Kristine! I’m with you – pumpkin everything! Love oats in cookies! Great for snacking or mid-time craving! Plus delicious! I agree. From breakfast to dessert – oat cookies are fab! Thanks, Savita! Yay for pumpkin recipes! Double yay for crunchy ones! 😀 I never can get enough of pumpkin spice anything – such a comforting flavour! These look so good. Pass over a few my way! This is such an easy one to start with. Hope you love them, Meliann! Thanks, Aimee! I love all things fall! I made these for my mom, who has to watch her gluten intake. She really liked them, but my husband and I enjoyed them too! 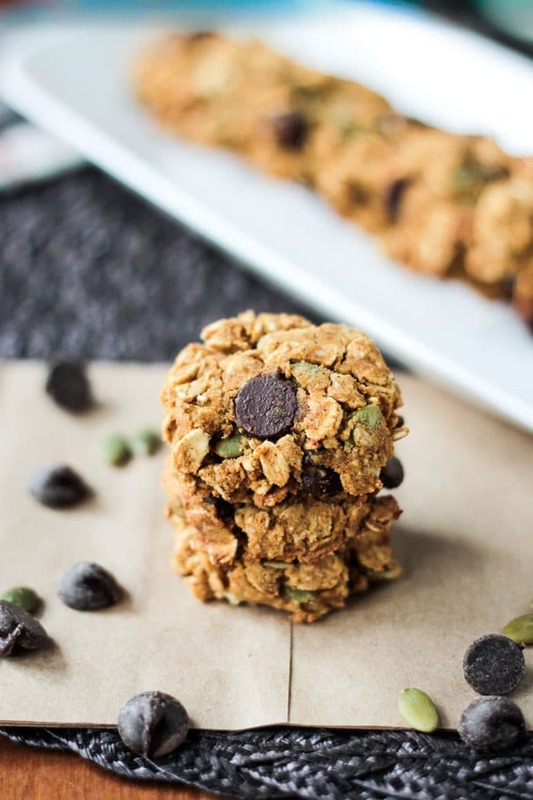 A tiny cookie packed with healthy ingredients, yet it satisfied my craving for something sweet! Thank you! That’s awesome, Sara! And they are so easy too, right?! Thanks so much for your comment! they look so amazing and delicious! oats are awesome in cookies! Thanks, Sina! Me too. They are my favorite! LOVE these girl! Love how low-fat and healthy they are! Brown rice flour is a favorite of mine too. That is what I use for my chocolate chip cookies and the crispiness they provide is amazing! I love that you added all these yummy oats too, YUM! Thanks, Brandi!! Yes, the brown rice flour definitely gives them that extra crispiness! Cookies healthy enough for breakfast…bring it! Thanks,Lucie! I love pumpkin seeds too! They are just as addictive as these cookies! The rice flour does a little binding…as much as all purpose or whole wheat. The dough is a bit crumbly, but when you press it together, it does hold up well. I do find that brown rice flour makes things a bit crispier or crunchier than regular flour…which worked perfectly here! The perfect fall bite! The exact type of sweetness I love! Thanks, Rebecca! They didn’t last long around here!